Who doesn’t love a good outdoor barbecue in their backyard? 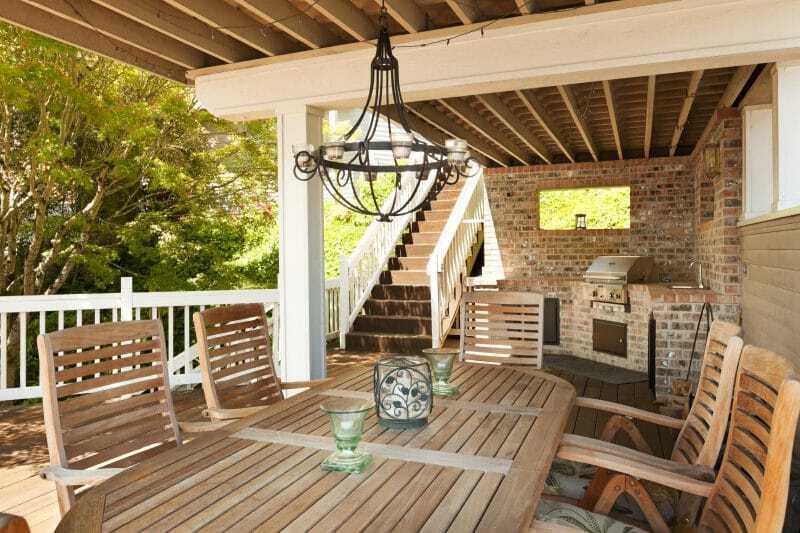 Weather permitting, many homeowners enjoy entertaining and having meals outdoors. Picture grilling steaks while chatting with friends, watching kids enjoy the sun on lounge chairs with the sound of birds chirping nearby, or just enjoying a weekday night of burgers while counting stars. The outdoor version of a kitchen expands living space and sometimes works as an extension of a deck or an indoor kitchen. At times it can stand alone as a separate outdoor room. Cooking outside keeps food odor and fumes in check…that alone is a big plus. As you will see from the outdoor kitchen ideas below, there are so many great options which you may be able to adapt in your own backyard. Nothing is off limits for these outdoor wonders — custom grills and cooktops, fully equipped range systems, pizza ovens, wine coolers or you can go bare minimum with just a simple barbeque station. 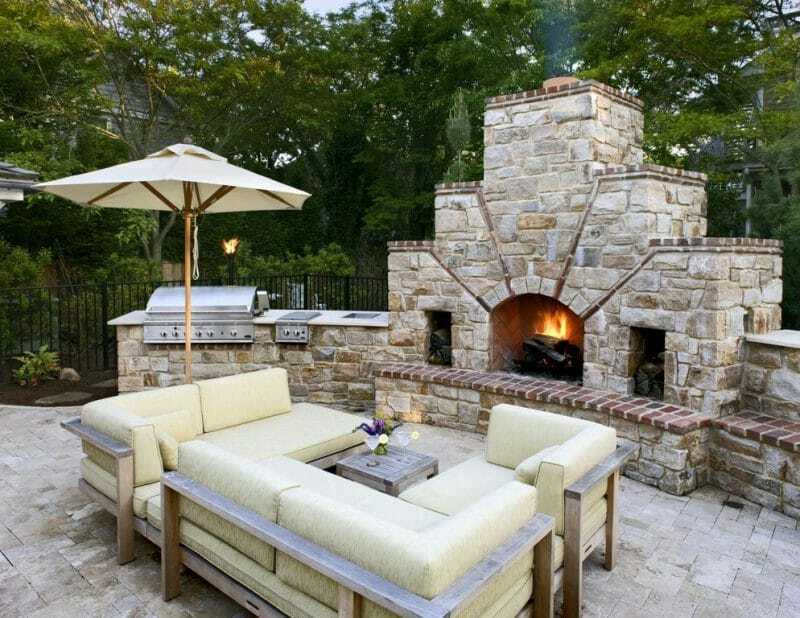 Consider a built-in brick or stone grill for a rustic inspired patio, or a bar installation to resemble an outdoor saloon. If connected to a main kitchen, French doors and accordion windows can open up to accommodate seating, while extended awnings and pergolas provide shade. And don’t forget the small details — lighting for the cook, ice chests, potted plants, hangers for utensils as well as pot racks. Be one with nature and share the joy with delicious meals all year long…fond memories guaranteed! So below are today’s selection of outdoor kitchen ideas that we thought may give you a few ideas to enjoy cooking al fresco. Hope you like them! Beautiful day to you. The Little Plus: the built-in counter made of stone and bricks — stable and strong materials built to last a lifetime of outdoor cooking goodness. Lots of under counter cabinet space for grilling equipment and of course, the accessible refrigerator for all your garden party cookout beverages. And a helpful partner for the chef is the corner sink — making prep and cleanup fast and easy. Let the festivities begin! 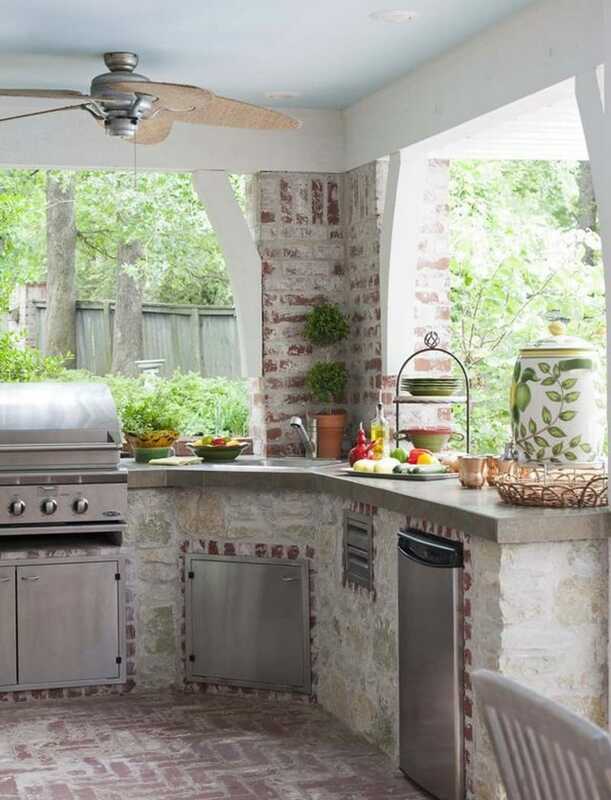 The Little Plus: the elevated brick patio and outdoor kitchen in one — practical and convenient use of space that’s just outside your living room. The white pergola that matches with the dining table chairs and window frames brighten the space giving it a breath of fresh white. 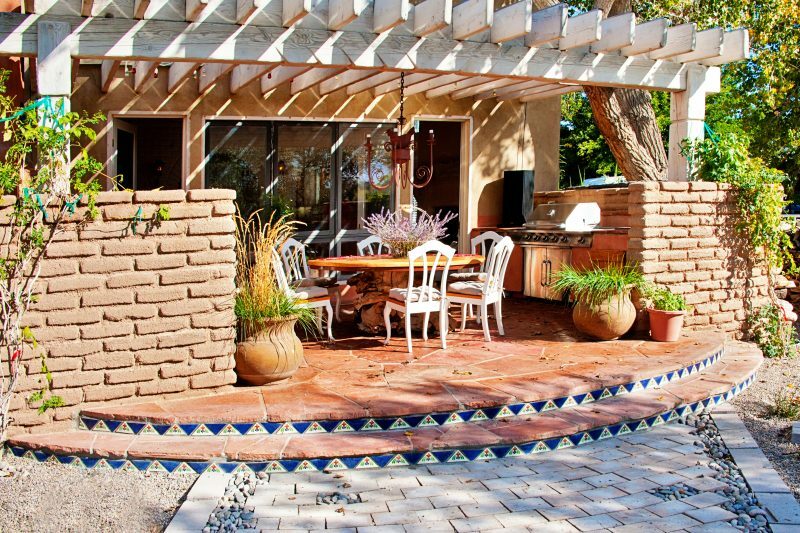 And the decorative Mexican-inspired tile on the steps pop out with color and infuses a fiesta like vibe. Hola! And notice the interesting tree trunk base of the table? Repurposed and in its natural state, it’s earthy warmth will remind you of days spent camping and getting back in touch with nature. 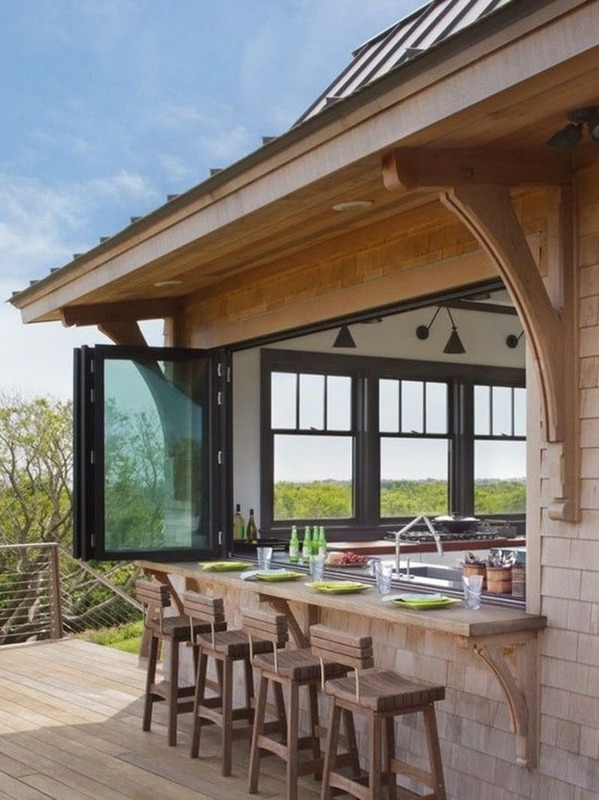 The Little Plus: the modern bi-fold windows slide open to incorporate the outdoor counter/bar seating into the sunroom kitchen. Also, you can see how the counter as well as the wood bar stools are stained in the same natural finish as the wall shingles — nice tie in! And for some contrast, the geometric shaped lighting fixtures matching the window frames add some dark accents to this outdoor kitchen.